Is there anything you can not get from a vending machine these days? 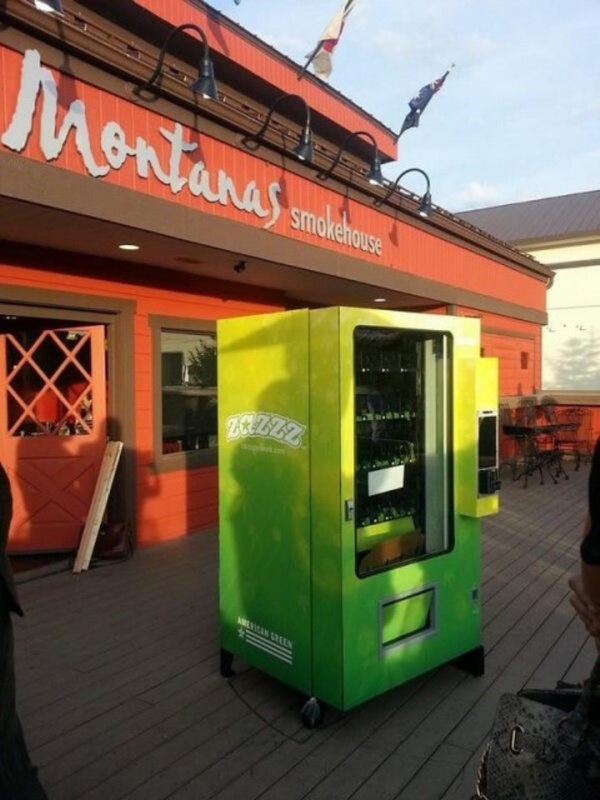 The first marijuana vending machine–at least, in Colorado–was recently rolled out on the patio of Montana’s Smokehouse in Avon. It’s different from other pot-dispensing vending machines in the sense that it’s accessible by anyone. For example, marijuana vending machines already exist in California, but they’re often located behind counters so you wouldn’t be able to dispense it yourself. However, even though access to the machine isn’t limited, access to marijuana is. Only those who are medical marijuana cardholders will be able to dispense the goods, since the machine is equipped with a scanner that verifies the person’s ID first before dispensing anything. Stephen Shearin, who is the COO of Tranzbyte, explains that he believes the machine will be a lot of help for folks who might feel shy having to buy marijuana, even though they’re doing so legally. By Hazel Chua on 08/30/13 • Leave a comment! This is one vending machine that I’d love to see in my office. 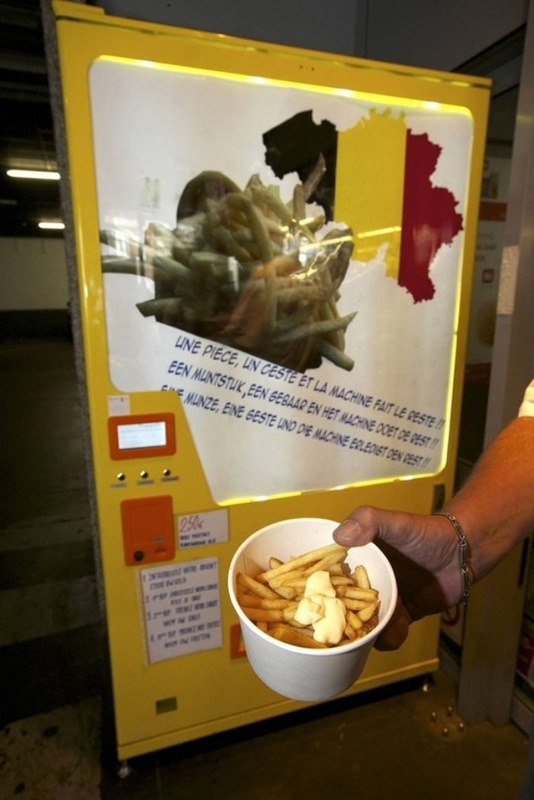 It’s a french fry vending machine and it dispenses hot fries in less than two minutes. This particular machine is located in Chaussee de Gand-Steenweg op Gent in Brussels, Belgium and it costs €2.50 (about ~$3.35) for a cup of hot, crispy fries. Buyers can choose to have their fries topped with either mayo or ketchup, although it’s too bad the machine doesn’t allow you to get both. You get a generous serving in the cup and I’m definitely willing to fork over a couple of bucks to get my fill of fries anytime I want. By Hazel Chua on 08/16/13 • Leave a comment! Getting free beer doesn’t get any easier than this. All you have to do is stand in front of this vending machine and do nothing for three minutes. It’s that easy. 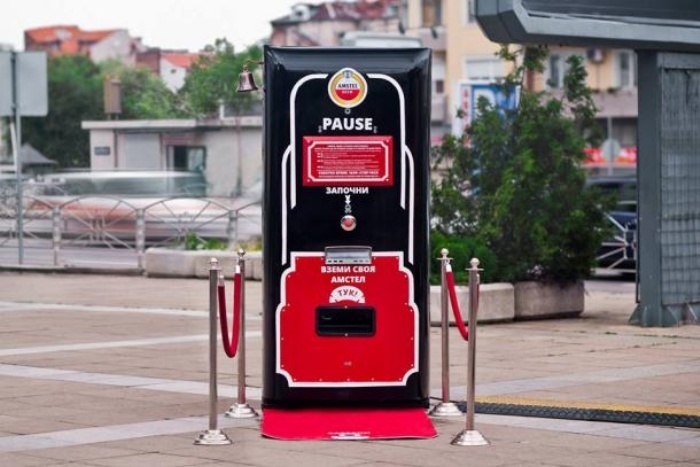 This is the latest in a series of advertising stunts done by various companies using a vending machine that doles out free goods in exchange for a random or sometimes unusual action by the person. The one set up by beer company Amstel is called the Amstel Pause and it definitely stays true to its name. Anybody who wants a cold one only has to press a button to start the timer and stand on the designated spot in front of the Pause. Once the three minutes is up, the machine dispenses a can of booze. A Gift From Tech Heaven: Gadget Vending Machines! The Dallas/Fort Worth airport has a new vending machine to go with the Coca-cola cans and Kit Kat bars, only a purchase would likely require more than 400 quarters(or a credit card). 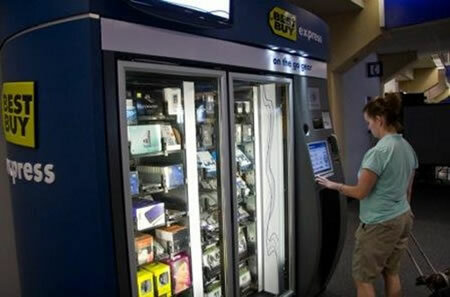 Best Buy has put in Best Buy Express machines that will dispense a variety of gadgets for the consumer on the go. The vending machines, located past security at Terminal B’s Gate 29 and Terminal E’s Gate 32, have items like iPods and all the needed accessories for sale. A fast and easy way to spend hundreds of dollars means Best Buy will be raking in the money from these machines, especially from parents who forgot to get their kids a present while they were away. Since these are in an airport, I’d suggest not kicking the machine if your item gets stuck or you might get a free taser demonstration.